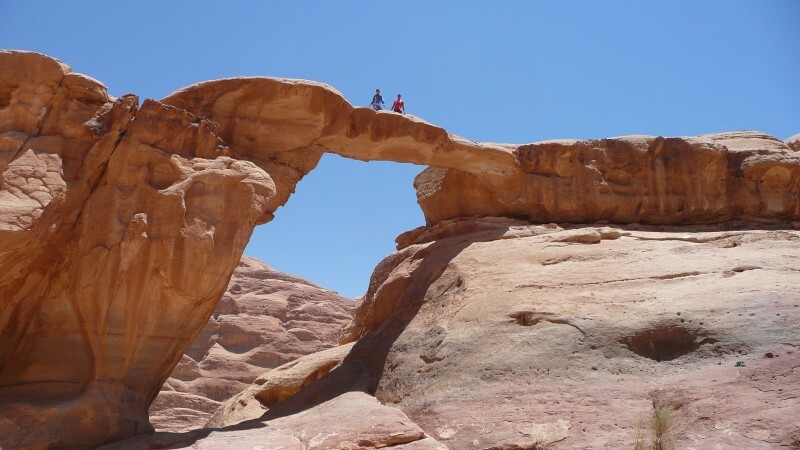 Discover the difference and enjoy two day tours to Petra and Wadi Rum in Jordan from Dahab to visit the rose red city, the Siq, Royal Tombs and Qasr Al Bint and Wadi Rum. Egypt Travel representative will pick you up from you hotel in Dahab and transfer to Nuweiba by a private air-conditioned vehicle. Upon arrival in Nuweiba port, take the ferry boat to Aqaba. Our representative welcomes you at Aqaba Port, then transfer for 1.5 hours to Petra and start to visit "the rose red city". On horse back or on foot, you reach the Siq, a narrow gorge, and walk more than 1 km till you reach the beautiful Treasury. From here you go on to the Street of Facades, the Royal Tombs and Qasr Al Bint. Overnight in Petra at Petra Palace Hotel. After breakfast we drive 1.5 hrs to Wadi Rum, one of the most impressing desert landscapes in the world. The area was made famous in the west by Lawrence of Arabia who described it as "vast, echoing and god-like". Discover the area featured by rugged mountains and coloured sand dunes during a 4x4 Jeep tour. Transfer to Aqaba port to catch the ferry boat to Nuweiba in Egypt. Upon arrival in Nuweiba, transfer to your hotel in Dahab & overnight. Local English speaking guide in Petra for about 2 hours from the entrance to the Treasury. Trip for 2 hours 4x4 Jeep tour in Wadi Rum.